A file with the DIZ file extension is a Description In Zip file. They're text files found within ZIP files that contain a description of the contents of the ZIP file. Most are called FILE_ID.DIZ (for file identification). DIZ files were originally used with Bulletin Board Systems (BBS) to describe to the website administrators what files the users were uploading. This process would happen automatically by having web scripts extract the contents, read the files, and then import the DIZ file into the archive. Nowadays, DIZ files are most often seen on file sharing websites when a user downloads an archive full of data. The DIZ file is present for the same purpose, though: for the creator to tell the user what it is that's contained in the ZIP file they've just downloaded. NFO (information) files serve a similar purpose as DIZ files but are much more common. You may even see the two formats together in the same archive. However, according to the FILE_ID.DIZ specification, the DIZ file should contain just basic information regarding the archive's contents (just 10 lines and a maximum of 45 characters), while NFO files may have more information. 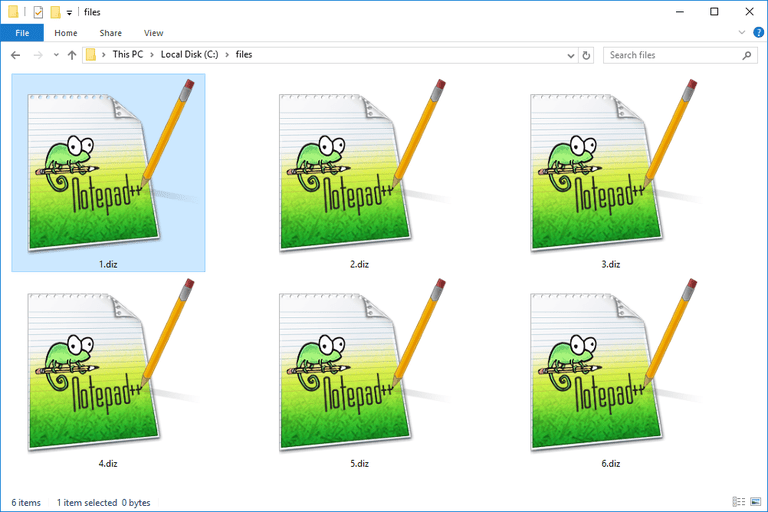 Because DIZ files are text-only files, any text editor, like Notepad in Windows, will successfully open them for reading. Since just double-clicking on a DIZ file won't open it in a text editor by default, you can either double-click it and then choose Windows Notepad or, if you have a different text editor installed, open that program first and then use its Open menu to browse for the DIZ file. If neither of the above programs work, we recommend trying NFOPad or Compact NFO Viewer, both of which support ASCII art, which some DIZ files may contain. macOS users can open DIZ files with TextEdit and TextWrangler. If you find that an application on your PC does try to open the DIZ file you have but it's not the one you'd like, see How to Change File Associations in Windows for a quick how-to on changing that program. Since a DIZ file is just a text-based file, you can use any text editor to save the open DIZ file to another format like TXT, HTML, etc. Once you have it in one of those formats, some programs support exporting the file to PDF, which is helpful if you want the DIZ file to ultimately be in the PDF format. For example, opening the HTML file (that you made by saving the DIZ file to an HTML file) in the Google Chrome web browser will let you save the file to PDF. This is essentially the same thing as converting DIZ to PDF. You cannot usually change a file extension to one that your computer recognizes and expect the newly renamed file to be usable. An actual file format conversion is usually necessary. However, since a DIZ file is just a text file, you could rename FILE_ID.DIZ to FILE_ID.TXT and it would open just fine. DIZ files are just descriptive text files, meaning they can only be converted to other text-based formats. This means that even though the DIZ file is found within a ZIP file, you can't convert one to another archive format like 7Z or RAR.